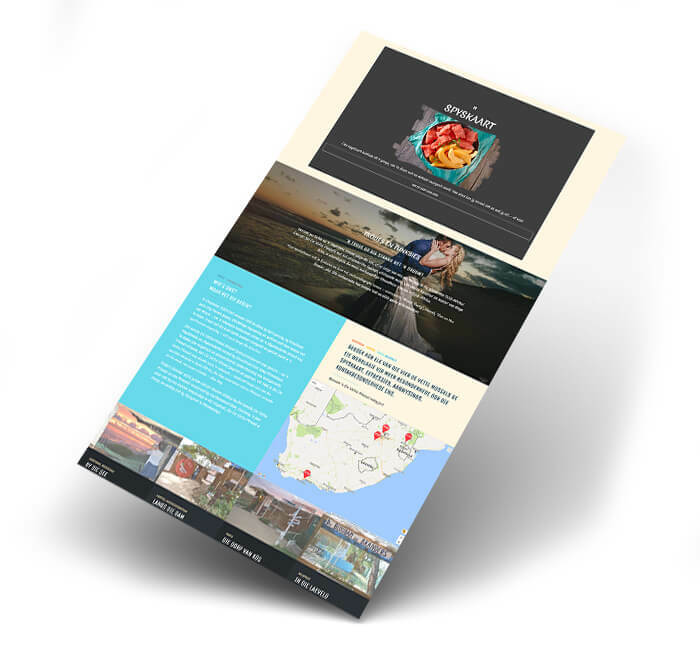 For this tasty project, the team at The Website Engineer was asked to recreate the local, homey atmosphere of De Vette Mossel, a ‘sand-between-your-toes’ style seafood restaurant that caters to local and international guests and their families, across South Africa. With their open, buffet-style menu, they encourage visitors to eat as much as they want (or can!). It’s an open-air seafood experience that brings the beach to you, serving 16 top-quality dishes in Grootbrak, Mossel Bay, Parys, and Hartbeespoort Dam. 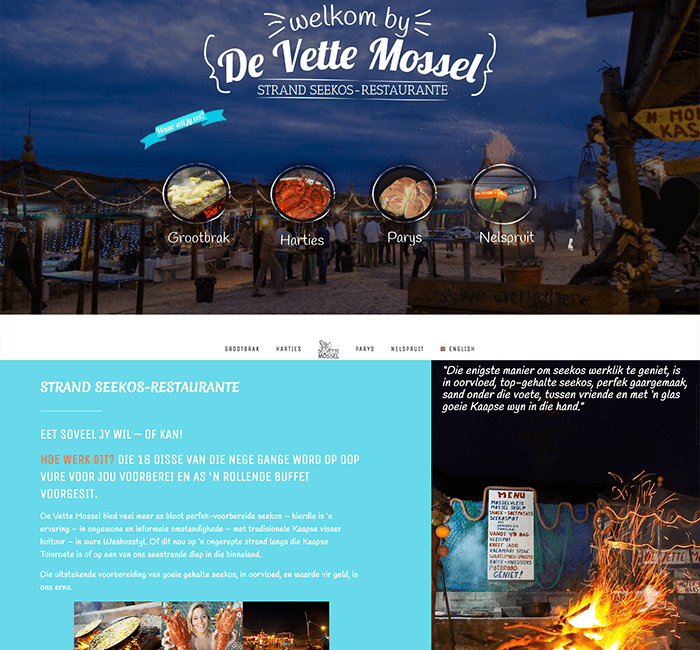 To make sure De Vette Mossel’s new website was accessible and friendly, we added some funky animation to it – such as animated footprints sneaking behind you in the sand as you scroll through the website – while adapting the basic site design for each of their three different franchise branches to suit their individual needs, and keep the look and feel local. These individual websites, which can be updated separately, let each branch add specific information about live events, availability calendars and seasonal changes on their own, without any technical expertise. 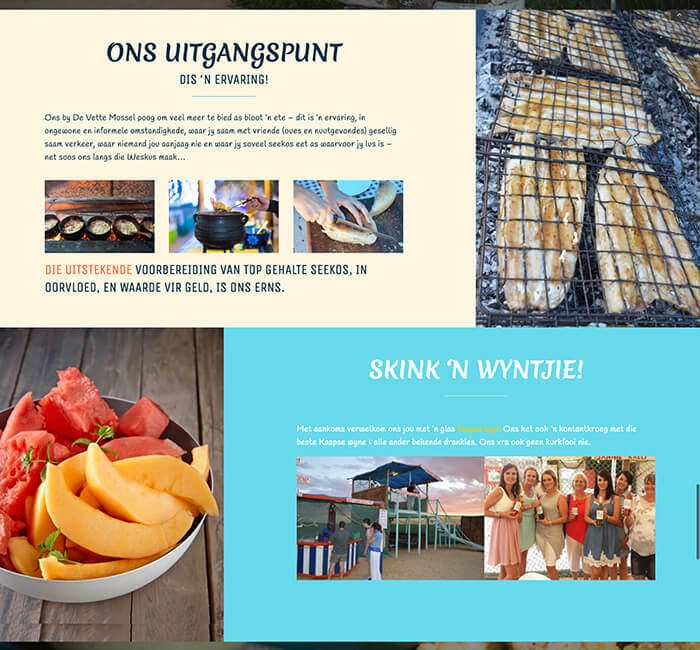 From the user side, De Vette Mossel wanted a universal website that anyone of any age (from 3 years old to 93 years old) would find visually attractive, easy to navigate, and informative – one that captures the unique experience De Vette Mossel offers to its guests. From the side of its restaurants, they wanted it to be simple and easy to implement changes that will reflect across all four independent websites, without incurring additional costs. 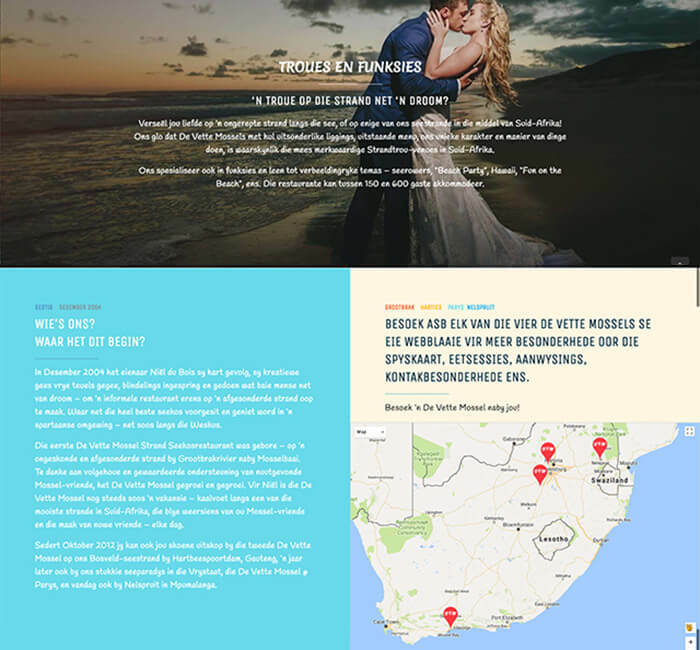 They Website Engineer was happy to give them both, helping more South Africans find great seafood near them.